Doran Design has 20 years experience in design consulting for 2D and 3D design. So, what do we design? – Interior and exterior exhibition stands, bespoke 3D displays, modular stage sets, bespoke stage sets, event staging, modular exhibition systems, bespoke stands, signage, corporate logos, corporate stationery, roll-up banners, hang-on graphics, menu lecterns, literature racks and many more. And what does our service to you include? – We don’t manufacture anything. We simply provide all the design services you could need. We provide the briefing, concept ideas, drawings, artwork and visuals and, finally, project management, working closely with contractors and clients on achieving beautiful and professional designs for various purposes. We aim to cater for your exact needs or offer exciting ideas and designs if needed. Just contact us to discuss your requests. As you can see from the images below, we have been the trusted choice of many renowned companies and have undertaken some appealing designs for the likes of Honda, Vauxhall, Novotel, Sofitel, Lexus, Betview and many others. Tracey Doran is managing director of Doran Design, a design consultancy specialising in exhibition stand design. In the final part of a six-part series, Tracey takes a look at the live events industry. 29/05/2008 - [Part 5] Shake it all about! Tracey Doran is managing director of Doran Design, a design consultancy specialising in exhibition stand design. In the fifth of a six-part series, Tracey takes a look at the conference and events industry. 29/05/2008 - [Part 4] Exhibiting - the boring bits! Tracey Doran is managing director of Doran Design, a design consultancy specialising in exhibition stand design. In the fourth of a six part series, Tracey takes a look at managing health and safety at exhibitions. 29/05/2008 - [Part 3] Are you sitting comfortably? Tracey Doran is managing director of Doran Design, a design consultancy specialising in exhibition stand design. In the third of a six part series, Tracey reflects on the key benefits of utilising exhibition furniture. 29/05/2008 - [Part 2] What’s in a name? Tracey Doran is managing director of Doran Design, a design consultancy specialising in exhibition stand design. In the second of a six part series, Tracey reflects on company branding. 29/05/2008 - [Part 1] It stared with a Wang! 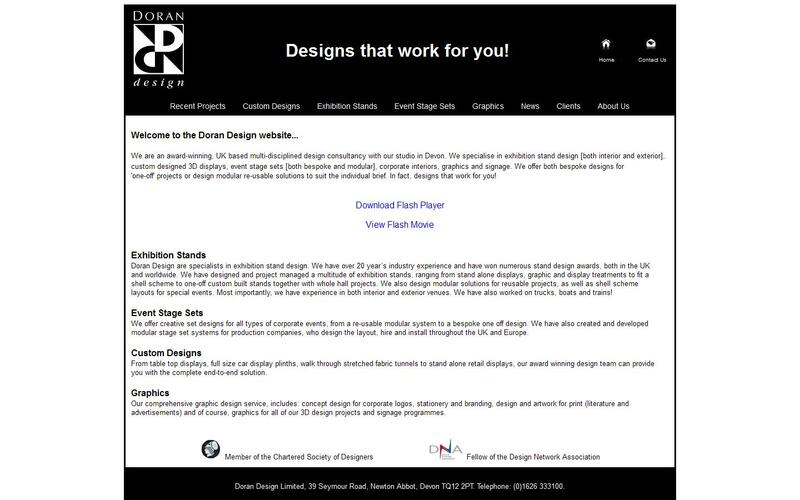 Tracey Doran is managing director of Doran Design, a design consultancy specialising in exhibition stand design systems. In the first of a six part series, Tracey reflects on a new concept design for a modular stage set system!